This review will be discussing plot points which may be considered spoilers. Consider yourselves warned. The word Ararat has a special meaning for believers of Judeo-Christian teachings. To them it symbolizes hope, rebirth, cleansing—even the spring of a new world. 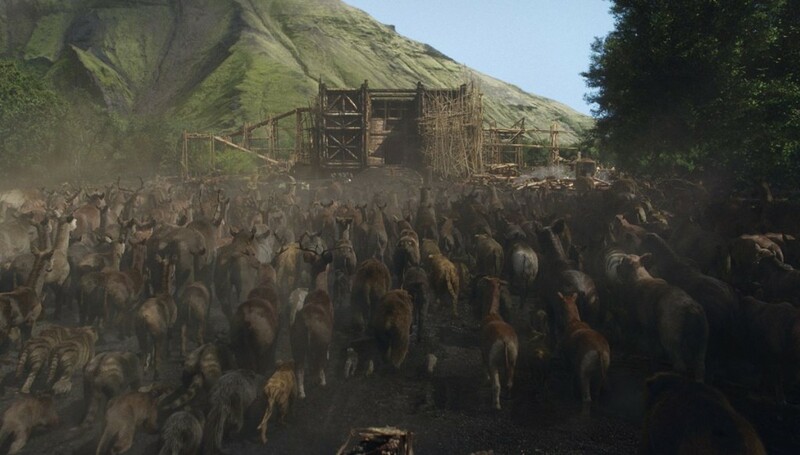 Interestingly, the word never makes an appearance in the new Hollywood film Noah, but the symbolism of Mt. Ararat, the final resting place of Noah’s Ark, is steeped into every aspect of the movie. The first thing to mention about this movie was the acting. 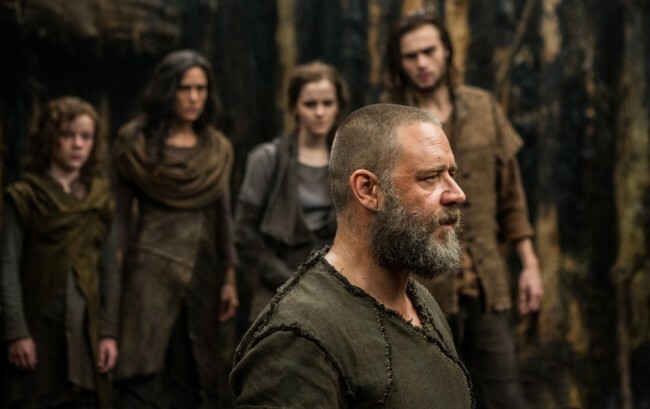 Russell Crowe (Noah), Jennifer Connolly (Naameh, his wife), and Emma Watson (Ila, an orphan girl) are an all star cast, and I would expect nothing but a stellar performance from them. They did not disappoint. The supporting roles were filled with really excellent actors as well, with Anthony Hopkins as the surprising choice for Noah’s very elderly grandfather Methuselah, and Ray Winstone as the evil local king/tribe leader Tubal-Cain. There was a cameo appearance by one of my all time favorite, underappreciated actors Martin Csokas, as Noah’s father Lamech. The only supporting character that did not have an outstanding performance was Japheth, played by Leo McHugh Carroll, but this makes sense considering the lack of information about him in the source material. The relationships in this movie were probably the very best, most honest portrayal of a family that I have seen from Hollywood since the great epics of the late 1950s and 1960s. True affection and forgiveness is difficult to fake , but between the excellent script and the superb acting through the family focused scenes at the beginning and end, this movie pulled it off. I loved seeing Naameh (Jennifer Connolly) cuddling a baby Japheth in some of the opening scenes. It is so easy to forget that babies were just as sweet and fragile 6,000 years ago as they are today. There was a lot more story—not just Noah’s story—crammed into this film than I was expecting. The movie started with the story of Man, and his fall. This was presented in stop action animation and subtitles in a font that disturbingly resembled comic sans. Three symbols from this initial story are repeated as a motif throughout the movie that alerts the viewer that they are now watching a dream or a prophecy revealed through a trance. The first symbol is a green snake slithering through the grass, the second is a fruit that pulses like a beating heart, and the third is the silhouette of Cain’s upraised arm and hand grasping a rock to club his brother to death. I appreciated why the motif was used but the last image was really hard to see, and every time it was used my concentration broke while my brain tried to figure out what I was seeing. I appreciated that the movie bothered to tell the creation story, and that it did not take sides on the issue. The story was told by Noah as a voice over a somewhat annoying time lapse animation. He told the original, Biblical version of creation with each part of creation taking a day to complete, but the animation that flowed with the story seemed to mimic a type of evolutionary influence. The movie seemed to go out of its way to avoid confrontation in other ways as well, such as strictly using “the Creator” to refer to God. It seems as though the script writers decided that destruction of the entire world by an enormous flood at the will of the supernatural being who created it all was not enough drama. In order to add to this, they included additional stressors to the family bond. While the Biblical account clearly states that Noah, his wife, his sons, and their wives were all aboard the ark when the door was shut, the movie takes a liberal interpretation. Noah decides that the Creator must be destroying the world to clean up the mess that man has made, and therefore must not want any more men in the new world. That’s completely fine, though, because Noah and his wife are past child bearing, and the only other woman on the ark—an orphan girl that they took in who is now the love interest of their oldest son Shem—is barren. Noah refuses to find wives for his other two sons, which is not taken well by the adolescent second son, Ham. Because Ham is angry at his father’s choice, he does not tell Noah that Tubal-Cain, the erstwhile king of the area, has stowed a ride on the ark, and actively conspires to kill Noah, and repopulate the earth with his own children. However, Noah’s plan for a humanless planet is thwarted by his wife, who goes to Noah’s grandfather, the aged Methuselah, and asks him to intercede with the Creator for her sons, so that they can have children and be happy. Methuselah gives his blessing to Shem’s love interest, Ila, and she gets pregnant on the ship. Noah is angry that his wife has gone behind his back and thwarted what he feels to be the Creator’s plan, and threatens to kill the child if it is a girl, so that there will be no chance at any more human children. This, of course, leads to quite a bit of screaming and crying on the part of every person on the ark, and an emotional climax that has almost nothing to do with the fact that they have been stranded on a floating box for months with no certainty that they will ever get off. Another addition to Noah’s story is the Watchers. These are fallen angels who defied the Creator in support of Adam and his race, and were cast down to Earth. I appreciated the physics of the story that the script writers were trying to tell: creatures of light and energy crashing to earth melted the stone, which then cooled around them. Unfortunately, this was a visually unappealing mess. I was also left wondering why the stone that formed around them did not erode over the thousands of years that they had been on earth—especially since they were moving a lot. Visually this movie was shot to be beautiful, not necessarily to be accurate. This was obvious through the use of a lot of sound stage settings, with actions designed to showcase silhouetting of characters against a setting sun. Most of the sets felt very unearthly (Methuselah’s mountain and the black volcanic ash expanses were mostly shot in Iceland). The visual effects are beautiful, but they do break the viewer’s concentration from time to time. The biggest problem that I had with this movie was the ambiguity regarding why Noah and his family were told to build the ark and be saved, and the other humans were to be destroyed. The beginning of the film showed that the murder of Abel by his brother Cain was one of the big influences for humanity veering wildly off the Creator’s track. However, Noah shows no compunction for killing humans because they’ve killed an animal. I was confused, and still wonder if the director/writers were trying to equate vegetarianism with being a good person. Since this is a movie about good versus evil, I would have preferred a sharper distinction between the good and the evil. As a moviegoer, I really enjoyed the experience that this film provided, but probably won’t add it to my DVD collection. As an admirer of the original account of Noah and the Great Flood, I hope that despite the additions to the story, people who have not read the original will be inspired to look it up and see what is really there. I give this movie three and half Death Stars.